Truck bed camping isn’t as luxurious as the RV life but affords more safety, security, and flexibility than regular ol’ camping. When you’re out on extended fishing or hunting trips, sometimes it feels like you’re living out of your truck. In fact, you may actually be living out of it. If that’s the case, it may be time to build out your own properly designed setup. As always, if you have truck bed camping experience, I want to hear from you! Leave your thoughts in the comments section. This article is geared towards building out your truck bed into a suitable living space. However, an elevated truck bed tent is a more instant option. Plus, these things are seriously cool. Basically, it’s a tent in your truck bed! If you’re interested in truck bed camping with a tent, RightLine Gear makes some high-quality tents for various truck bed sizes. The canopy is the most important part of your truck bed camping setup. What makes a truck canopy good? It’s weatherproof and doesn’t leak. Some canopies have elevated roofs to give you a little extra headroom. Also consider different window layouts to allow in enough light and ventilation. Pro Tip: If you’re trying to be stealthy, a truck bed canopy/cap with fewer windows may be a better option. While you can certainly purchase a canopy brand new from the manufacturer, I’d recommend checking out your local marketplaces for used (but cared for) canopies in your area. The biggest things to look out for with used canopies are rust and leaks. Option 1 gives you maximum storage space and is best for people taking shorter trips to do things like fish, rock climb, hunt, or anything that involves additional gear. The biggest downside of this setup is the coffin-like feeling you get from sleeping in an elevated platform directly below the canopy. If you choose to go this route, give a long look at canopies with extra headroom. Option 2 gives you maximum comfort at the expense of storage and is best for people taking longer trips or who don’t have a ton of gear. The biggest downside of this setup, obviously, is much less storage. It’s possible to build out additional storage along the sides of the truck bed — above the wheels — if you’re crafty enough to design it. A Note About Security: For both personal safety and peace of mind, make sure your truck bed camping build-out is secure. Both your tailgate and the canopy should have locks, but make sure they’re up to snuff. If you want to improve your security, you can devise a latching system using a hasp lock to provide an additional layer of security. Look, your truck bed ain’t the Ritz. You know that going in. And you probably don’t have a ton of free space for a luxurious sleeping setup. Nor do you want to add all that weight. So, what sleep gear is recommended? With those two or three items you can sleep like a baby without a lot of weight and without breaking the bank. I’d recommend a down sleeping bag (as opposed to a synthetic sleeping bag) because they’re lighter and last longer than synthetic sleeping bags with comparable insulation ratings. Read more about down vs synthetic sleeping bags on our site. As for a sleeping pad, I’d recommend a self-inflating sleeping pad for optimal warmth and convenience. 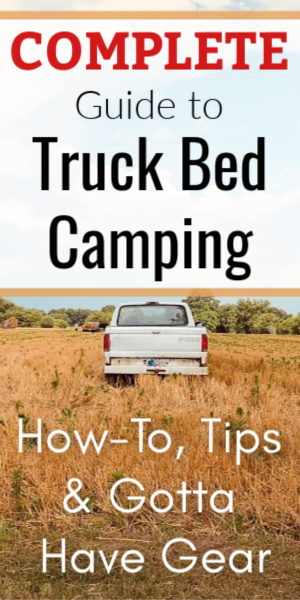 While you won’t be sleeping directly on the cold hard ground, you will be sleeping on the hard metal/wood surface of your truck bed camping setup. This REI Self-Inflating Sleeping Pad is a great option. You never think you need electricity until you do. (Or maybe that’s just me.) When you’re out in the wilderness it’s still nice to have a way to recharge you cell phone, laptop, or tablet, or to power any lights, camping fans, or cookware. Pro Tip: Do not forget to bring a camping fan. Seriously. All of that stagnant, stale air? I’m breaking out in hives just thinking about it. A camping fan is an absolute necessity for me. Here’s our guide to the best camping fans on the market. You’ll want to wire a power inverter to convert the DC current from your battery to usable AC current for your electronics, but I wouldn’t wire that directly to your car battery. The risk of killing your battery and ending up stranded is way too high. Instead, get a second battery and plan for it in your truck bed build-out. This 400W inverter can be connected either directly to a car battery or through a cigarette lighter, providing you with two 2.4 A USB ports and 2 AC power outlets. Are there any alternatives to rigging a dual-battery system? Absolutely. Connect directly to your car battery. If you do this I recommend having a portable emergency jumper. Use a portable power bank if you don’t need any AC ports. Check out our RAVPower vs Anker and Aukey vs Anker comparisons to see which is right for you. There are no universally correct answers here. It all comes down to what you need. Conveniently, your truck comes with one of the most crucial pieces of camping cooking gear already pre-installed: a tailgate table! However, most truck tailgates have an uneven surface that can make cooking a hassle. So, while you’re doing your truck bed build-out, consider attaching a piece of plywood to the inside of your tailgate for a flat cooking surface. Other than that, what else do you need for a mostly complete cooking setup? If you have room for a small cooler for meats/cheeses, that’s great. Consider some stackable Tupperware, too. It conveniently hides away and can be used for multiple types of storage (including cooking). Privacy should be a major consideration both when choosing your truck bed canopy and when building out your interior. Not only is privacy important for that feeling or personal safety, but it can be crucial if you’re stealth camping in an area where you shouldn’t be. Usually something as simple as a curtain system for your canopy windows will suffice. These are inexpensive and easy to install. If you plan on running interior lights after dark, make sure you take it for a test run before hitting the road by firing up the lights at night and observing their brightness from the exterior of your truck. With the basics out of the way, here are some handy pieces of truck bed camping gear to help you make the most of your time. DIY Awning System // Limited and/or cramped space is the name of the game when truck bed camping. Give yourself some extra livable space by rigging an awning system. You can get the job done with a tarp, guylines, and poles. You could also skip the DIY part and get one of these awning systems, which you install on the roof of your truck for convenience. Bug Netting // A bug net system can be worth 100x its weight in gold. You could go with one of these pyramid bug nets, which can be affixed to the roof of your truck canopy, or just a big net that drapes over you. Cotton Sheets // Sleeping bags are fantastic in cold weather. In warm weather, sometimes you just want to lay on top of the sleeping bag with a light sheet covering you. Opt for darker colors because they don’t show dirt as much. Down or Polyester Pillow // I mentioned this above, but a small pillow can make a world of difference in terms of a comfortable night’s sleep. Down or polyester is best. Pee Bottle // Or, you know, an empty water jug. Portable Solar Panel // I like to use renewable energy when possible because, well, it’s renewable. While my car battery may die, I’m confident the sun won’t. These Goal Zero Nomad 14 solar panels weight just under 2 lbs and can put out 14W via a 2.4A USB port and 1.0A 8mm port. It’s perfect for recharging your portable devices and measures only 12″ x 8″ so it can be taken on the go if you’re hiking, fishing, etc. Portable Shower // At home, I’m a twice-a-day showerer. On the road I sacrifice, but that doesn’t mean I have to be a smelly mess. Campground showers are fine, but if you’re roughing it away from any facilities, a portable shower can make a big difference (especially if you plan on swimming). Also, DUDE Wipes are a lifesaver. Fishing Gear // Speaking of fishing, you may want to bring your gear! We’ve put together our lists of best fishing waders and best fishing line, so check those out. Comfortable Camping Chair // You aren’t going to want to spend all day in your cramped truck bed. In fact, you’ll probably want to spend as little time in there as possible. An inexpensive, compact camping chair will get the job done. Heck, a tiny camping stool even has its place! But if you want the granddaddy of all camping chairs, you’ve got to check this bad boy out: the Nemo Stargaze Reclining Chair. Small, compact, lightweight, and reclines. Fire Starter // Matches are fine. Even a butane lighter. Or you could go “survival mode” and get a flint fire starter. First Aid Kit // By failing to prepare you’re preparing to fail. (I’m sure you’ve heard that before.) Don’t skimp on your safety. Get a good First Aid Kit. Fire Extinguisher // Again, safety. Velcro // You’re probably hesitant about drilling holes in your truck bed or canopy. I don’t blame you! Velcro is an awesome alternative for lightweight items. Just be careful about suspending too much weight from your canopy ceiling, as it poses as safety hazard and could damage your canopy. Temperature and Weather Monitors // Speaking of things to affix with Velcro, a digital temperature and weather monitor is useful to have on the inside of your truck bed. In fact, I’d argue that the most important part of your weather system isn’t the thermometer — it’s the barometric pressure monitor. If you notice the pressure dropping, a storm could be on its way. It’s a great early warning system because few things are worse than scrambling to pack up wet gear into your cramped truck bed. Duct Tape // Because everyone knows Duct Tape fixes anything. Coffee Gear // I don’t go anywhere without my coffee gear. Check out our Complete Guide to Camping Coffee for everything you need to know. Quick Dry Microfiber Towels // As a commenter on our list of 27 Car Camping Essentials pointed out, you need a way to dry things quickly! Microfiber towels are my favorite because they’re lightweight and dry out in a jiffy. If there’s anything you think we’re forgetting for the optimal truck bed camping experience, comment below!